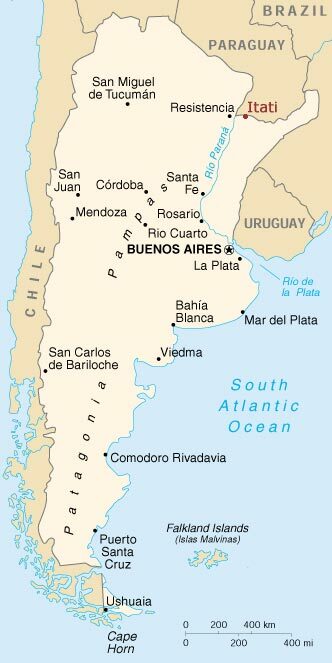 On August 17th 2002 I traveled to the small community of Itati, located about 1200 kilometers northeast of the city of Buenos Aires. Itati is in the province of Corrientes, bordering the Paraná river. From its coast the green Paraguayan subtropical forest can be seen without problems. Itati is where thousands of believers arrive from all parts of the country to bring their prayers to the Virgin of Itati. Although Itati only has a few houses, there is a majestic basilica that can be seen from the route already many kilometers before arriving to the community. Thanks to good reading and a small portable radio to check the local stations of each passing town, the 16-hour journey went quickly. When arriving at Itati, I was astonished to see how the cold winter of Buenos Aires had turned into a warm, almost summery climate, with extremely high humidity. Immediately after my arrival, I checked in to a simple but comfortable hotel called El Promesero. First I installed the most important, my shack of radio equipment, and afterwards headed for lunch. Exquisite fried surubi (for those who do not know it, surubi is a fish that can be found on all the tributaries of the Paraná river and it can be prepared in diverse ways), salad and good white wine comforted me after so many hours without having anything to eat. Then I walked around in the town and returned to the shade and comfort of my hotel room for the scorching afternoon hours. It was pleasant to listen to the many Paraguayan transmitters on mediumwave, just like some Argentine stations of the northeast region. After sunset, I took another walk in the town, took some pictures and returned to the hotel to begin listening. The shortwave panorama I am not particularly interested in. The vast experience in the matter of DX camps allows me to deduce that the further north I travel in the vast country of Argentina, the worse are the conditions for listening to shortwave. This was a celebration of mediumwave. Tens and tens of Paraguayan and Brazilian transmitters and even one Bolivian station were the most interesting catches filling my notebook. Also I dedicated a few hours to the FM band. Although the conditions of reception for the FM band were not the best ones I could tune into many transmitters of different cities and towns of the province of Corrientes, some from the province of Chaco and two stations of the city of Pilar, in the Ñeembucu departmento, in Paraguay. I ended the night of Sunday 18th of August somewhat before midnight, with a long walk to the small wharf of Itati, from where the lights of the small houses from the Paraguayan side can be seen. Monday was dedicated to walking around the small town and to recording Paraguayan mediumwave and FM stations, and also to do a little of FM DXing. In the afternoon I took a bus that after 16 hours brought me back to Buenos Aires.